Prosupps makes not one, but two notable pre workout supplements: Dr. Jekyll and Mr. Hyde. Unlike other brands that differentiate their pre workouts with slight variations, Prosupps created two completely different pre workouts. Dr. Jekyll NitroX is the modestly caffeinated pump matrix. Both supplements have their own unique advantages. Though when taken together, Mr. Hyde and Dr. Jekyll create a storm of energy, pump and weight lifting carnage! But before you dive in face first, let us explain to you the differences between Jekyll and Hyde pre workouts, plus how they have been recently reformulated with the new NitroX badge. Between the two of them, Mr. Hyde has always stolen the show. This is because Hyde packs a massive stimulant punch, a punch that you’ll remember. This is the main focus for Prosupps Mr. Hyde – Ridiculous energy! And that’s because of what’s inside the can. 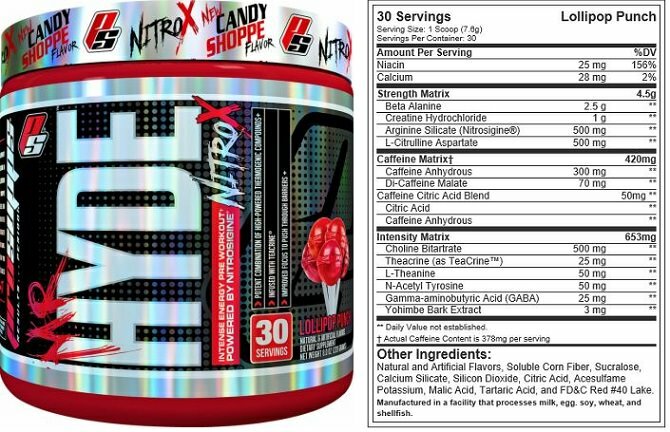 Approximately 400 mg caffeine: Mr. Hyde combines 300 mg of straight caffeine anhydrous with 70 mg extended release caffeine malate and 50 mg fast-hitting caffeine citrate. This is an exceptionally strong dosage. Exactly 28 mg of co-stimulants: Hyde also contains 25 mg of the new stimulant theacrine plus 3 mg of Yohimbe. Together, these ingredients increase the thunderous heat that the Hyde furnace creates. 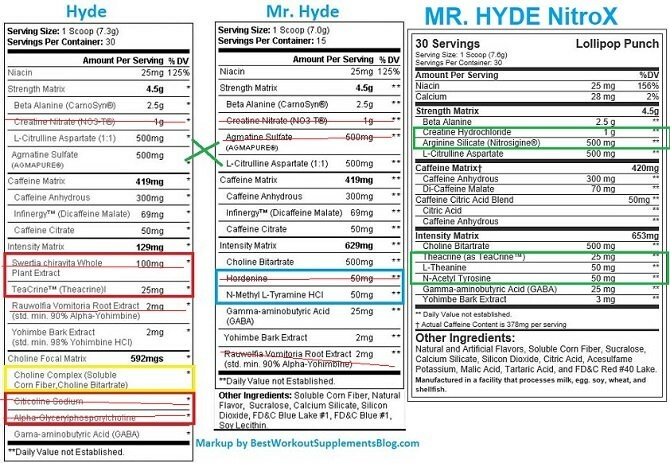 Another 625 mg of mood enhancers: Mr. Hyde includes 500 mg of focus promoting choline with 50 mg of caffeine calming l-theanine, with a pinch of GABA and NAC to make the experience ‘extra’. A 4.5 gram strength-base just cause: While the stimulants truly embody all that Mr. Hyde pre workout is, the formula also contains beta-alanine, l-citrulline, creatine HCL, and arginine silicate. Though, they aren’t the reason why you take this beast. To further explain this pre workout, let’s cover the formula in detail, starting with how it compares to Hyde’s previous formulation. The Mr. Hyde formula recently changed, hence the whole ‘NitroX’ thing. Creatine hydrochloride replaces the former creatine nitrate. Arginine silicate replaces the old Agmatine Sulfate. L-theanine, theacrine, and NAC have been added. Hordenine and a few extracts have been removed. But overall, the heart and spirit of Mr. Hyde remains unchanged in the new Mr. Hyde NitroX. Because like we said before, it’s all about that caffeine skull-punch. Now let’s talk about Dr. Jekyll. In contrast to Hyde, Dr. Jekyll contains a mere 100 mg of caffeine. In the world of pre workouts, that is an exceptionally low dose. 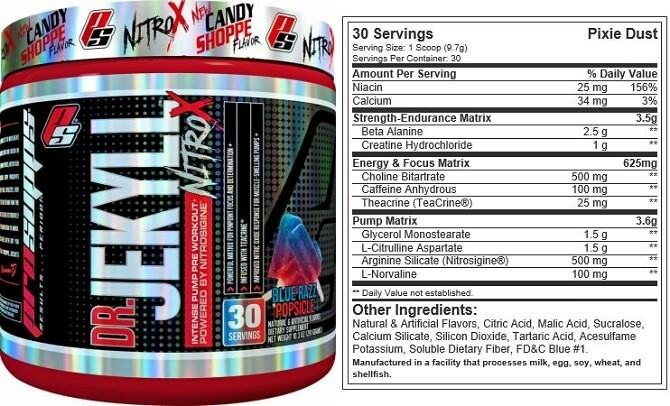 What Jekyll does contain, and in spades, is a unique blend of nitric oxide ingredients. Glycerol monostearate 1.5 grams: glycerol is an effective cellular volumizer that works independently to nitric oxide. L-citrulline aspartate 1.5 grams: Dr. Jekyll contains a triple dose of l-citrulline compared to the stimulant-focused Mr. Hyde. L-norvaline 100 mg: this ingredient preserves pump by slowing down the rate at which l-arginine is broken down. That means, more l-arginine for nitric oxide conversion. 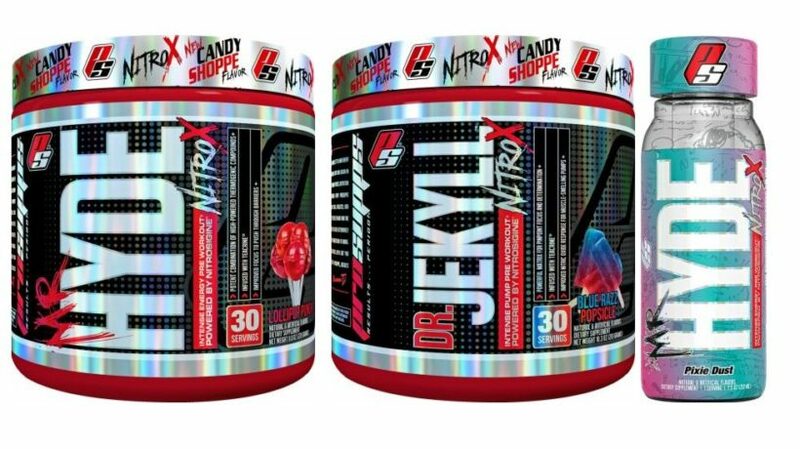 So, what changes did Prosupps make when Dr. Jekyll became the new Dr. Jekyll NitroX? Overall the formulas are quite similar like we saw with Mr. Hyde. Creatine nitrate was replaced with creatine hydrochloride. 25 mg of theacrine was added. GABA and Agmatine sulfate were removed. It’s basically the same thing as before, just with a little more focus. 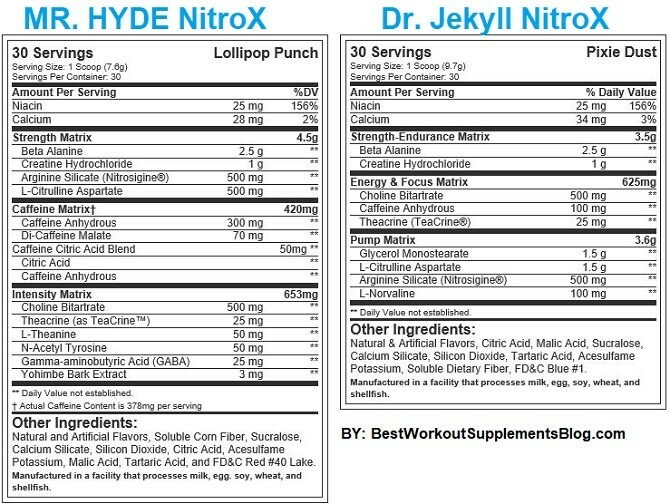 The ultimate Prosupps comparison has got to be between pre workouts Mr. Hyde NitroX and Dr. Jekyll NitroX. Like we said before, HYDE is stimulant focused while JEKYLL is pump focused. Which one of these Prosupps pre workouts is better? Need crazy energy? Mr. Hyde. Need light stims with pump? Dr. Jekyll. The biggest fascination that we’ve seen with Prosupps pre workouts, is what happens when you take both Mr. Hyde and Dr. Jekyll at the same time, together. To describe it simply one word will suffice: insanity. And that’s just the accumulation of shared ingredients. While you may feel the need to ‘look cool to your bros’ for taking this double decker of Hyde and Jekyll, we strongly advise caution. Only the most stimulant-tolerant individuals will be able to pull this off, and that’s not necessarily a good thing! We will forever appreciate what Prosupps did when they first made Mr. Hyde and Jekyll. Likewise we are happy to see that they’ve maintained the integrity of both products, to meet the needs of returning customers’ expectations. If you’ve enjoyed these two pre workouts over the last 5 years, then rest assured that the new formulas will still be a hit for you. Which is better Mr. Hyde or Hyde V2? Mr. Hyde is great for energy and focus. Nothing hits me as hard as Mr Hyde and you still get a decent pump. But if it’s a day where you have plenty of energy and really want that pump, then stick with Jekyll. Another plus to prosupps is that their products taste great too! which of these two products is a better Vascular dilator? 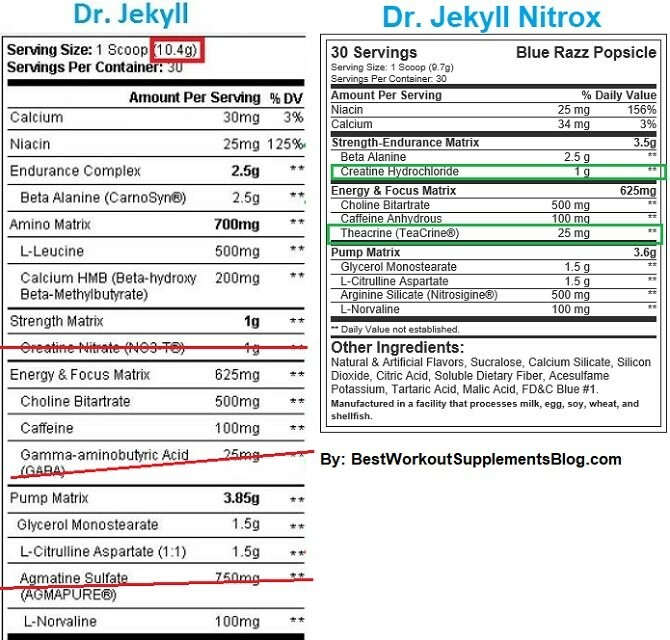 I was looking for Dr. Jekyll reviews, but this supplement comparison has answered my questions and more. Thanks.